Old White Man, 65, Sucker Punched In The Face By Cowardly Thug! A 65-year-old victim fell over a fence in Brooklyn Heights after he was sucker punched in front of an apartment building. A 65-year-old man went flying over a fence when he was sucker punched as he walked down a street in Brooklyn, police said Tuesday. The victim’s glasses were broken in the unprovoked attack, but he did not suffer serious injuries. 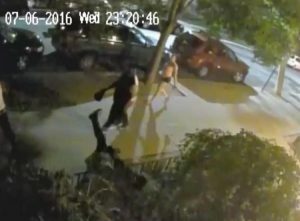 The assault, which happened around 11:15 p.m. on July 6, was captured on video released by the NYPD. The 9-second clip shows the victim and attacker walking toward each other in front of an apartment building at 99 Joralemon St. in Brooklyn Heights. As the perp breaks into a run, the victim is seen putting up his hands in a failed attempt to block the punch. As the blow lands, the man falls head first over a fence while the attacker keeps walking. The suspect is described as a thin black man, 5 feet 10 inches tall and 160 pounds. He was wearing black sneakers and a white t-shirt. He was with two other men and a woman — none of whom participated in the attack.